The Executive Director of SERAP, Mr. Adetokunbo Mumuni, made this known in a statement in Abuja on Thursday. Mumuni said the wife of the former president accused SERAP of using online, print and electronic media to publish unfounded and malicious allegations that she stole 15 million U.S. dollars and ought to be prosecuted. He said on Oct. 18, SERAP received court papers dated Oct. 6, from a court bailiff indicating that Niger Delta Youth Organisation for Equity, Justice and Good Governance sued for themselves and on behalf of Patience. The suit FHC/L/CS/1349/2016 was file in a Federal High Court, Lagos, against SERAP. 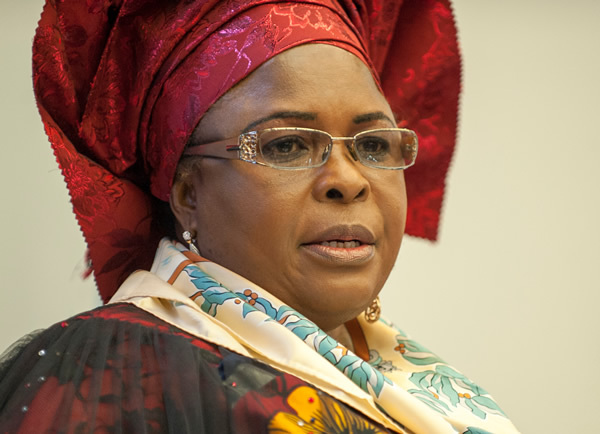 Mumuni said the plaintiffs want the court to restrain SERAP from taking any further steps in further vilification, condemnation and conviction of the former first lady in the media. He said the applicants want the court to direct SERAP to stay all action and to desist forthwith from proceed with any action Patience pending the hearing and determination of their siut. The executive director also said SERAP was served a separate application to be joined in suit FHC/L/CS/1318/2016 earlier filed by SERAP against the Attorney General of the Federation over allegations of 15 million dollars unexplained wealth against Patience. He said, “At no time did SERAP suggest or even hint that Patience was guilty of the allegations against her. “SERAP will never, in the discharge of its mandates, succumb to any intimidation, harassment and attacks in any way, shape or form. Mumuni stated further that SERAP had not engaged in any campaign against Patience or any other politically exposed persons for that matter. He said that its suit was filed against the Attorney General of the Federation and Minister of Justice Mr. Abubakar Malami, SAN, and not Patience. “It’s a joke to accuse SERAP of trying to coerce the Attorney General to perform his constitutional duty as this is for the court to decide, “ he said. Mumuni said that SERAP would consistently strive to ensure that its human rights and accountability works met international standards and the highest standards of analytical rigor devoid of bias or assumptions as to individual’s guilt.